I put the final touches on the Understanding Gauge course this week. I am very happy with the materials. The focus is using gauge rather than how to measure gauge, although that, of course, is covered as well. I want the course to be useful to anyone who has already taken the Basics class without two much repetition. It will take a lot of the mystery out of the "nuts and bolts" aspect of the design process. You can't teach creativity but you can explain the process. This course would benefit those who don't have much design experience who want to do Level 3. My students are so considerate. Somehow they know when I am busy writing and they don't send in their lessons. Of course, the beautiful fall weather could have something to do with it as well. The first part of the finishing class went very well (at least I thought so but I guess you'd have to talk to the students!) It is very nice teaching at home. If I forget something or someone needs needles or some such thing, it is easy to get it. The hardest part was putting in the extra leaf in the dining room table! The difference between the smooth and bumpy edges came up in the Finishing Class. I thought it would make a good topic for a tip as well, along with how to read your work. The long tail cast on is probably the most commonly used cast on technique. Most knitters just cast on and then follow a pattern but an understanding of this cast on can help you avoid potential problems in your work. The long tail cast on produces the first row of stitches as well as the cast on edge. Unless you are using some other version (and there are many!) this first row produces the smooth edges which is a match to knit stitches. For most projects the stockinette side is the RS or public side of the work. When you turn the work for the first row, the bumpy side (purl stitches) is presented. If you work this row as the first RS or public side, you have selected the bumpy side of the cast on as your RS. The photograph shows the smooth and bumpy sides of these small swatches. How big a deal is this? It isn't important at all as long as you are consistent. For example, if you have the smooth side as the RS on one sleeve and the bumpy side on the other sleeve, it isn't symmetrical. It is a matter of personal opinion as to which you prefer. The next time you use a pattern, see how the designer handles this. If the first row of the pattern is designated as a WS row, you know they have elected to have the smooth side as the RS. If they have the first row after the cast on as a RS row, then it is up to you to change this, if you want the smooth side as the RS. If you are doing the Masters Program or taking any TKGA classes, you know that you have to tag your work. Tags are always placed in the upper left hand corner of the swatch. (The arrows mark this spot in the photograph.) This is the industry standard. This lets the person looking at the swatch know which is the RS and tell the top from the bottom. In the Masters Program, this lets the reviewer know that the knitter can tell the difference between the cast on edge and bind off edge. 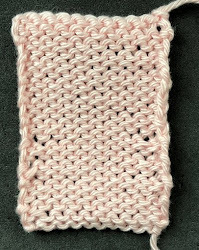 The nature of the knit stitch and the purl stitch is that they look the same upside down. If you are seaming something it is important that you start from the cast on edge and work to the bind off edge. Otherwise the stitch orientation is upside down and you will either use a half stitch or a stitch and a half for the seam. In most projects this isn't a big deal as the shaping tells you what is the top and what is the bottom. For something square or rectangular, it can be a problem. 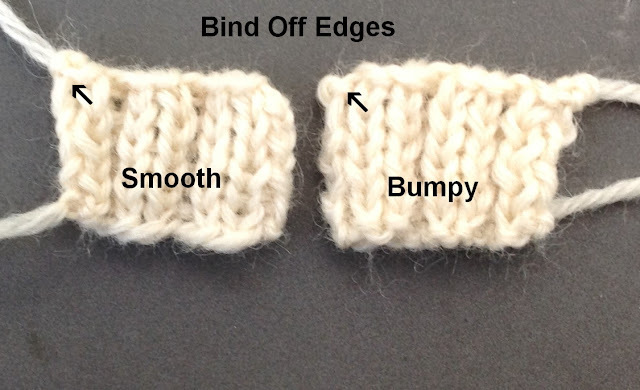 If you don't know what the bind off edge looks like (as I've said, lots of knitters never look at their work), pay attention the next time you bind off and you will notice that the bind off edge is interlocking loops. (That assumes you are using the standard bind off.) 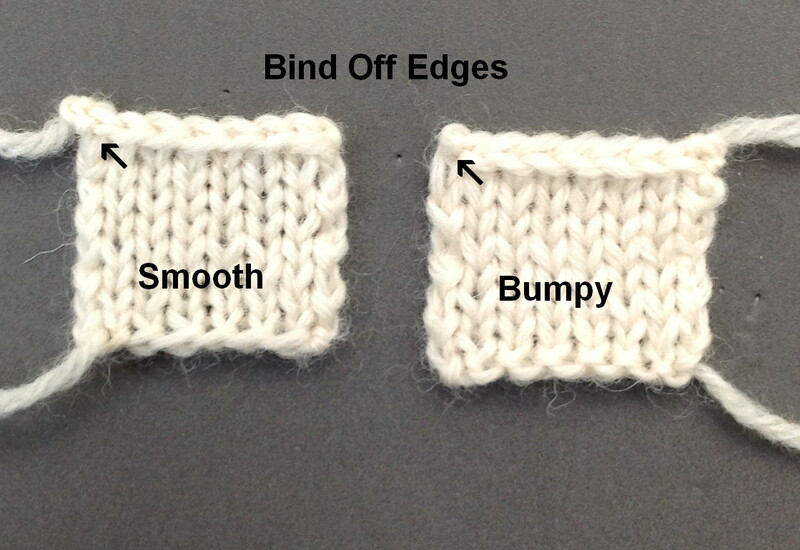 The bind off edge does not look like the cast on edges, smooth or bumpy. By the way there are very many different ways to cast on and in some cases you can match the cast on and bind off edges if you are knitting something like a scarf. There will not be a knitting salon this week (or probably for the rest of the month. I've got some deadlines I need to make and between that and the opera schedule and teaching on Sundays, it may not happen. I'll decide each week. 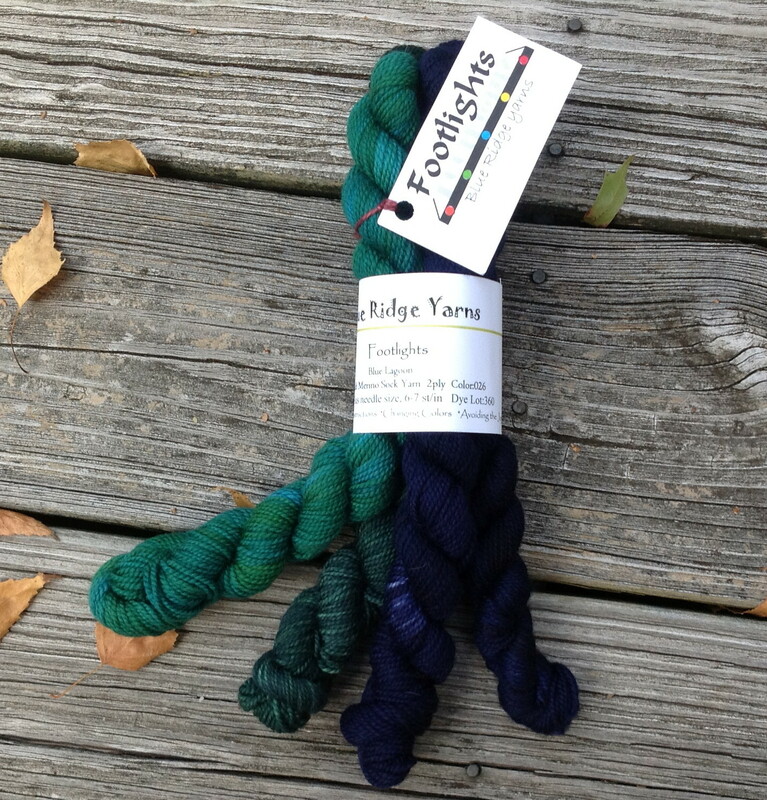 I have been yammering on both here and in Ravelry about the importance of looking at your work. You think I would take my own advice. I was looking at the shawl I am working on (and I was at least half way done) when I noticed a GLARING ERROR about half way down. I wish I could just say, "Oh, well" and then make a note for the photo shoot to hide the error but I simply cannot do that. I ripped it back to the error so I am pretty much where I was last week. Hence, no updated photo. This particular lace pattern requires that you pay attention. I'm hoping to finish it up this week. I now am looking at it very closely every 12 rows. The yarn for the final project I am doing for the Spring issue of Cast On arrived. I saw this yarn at TNNA and thought it looked fun. I am doing the wave socks I did for Babel but in these colors. They package the colors separately which makes them ideal for fair isle or intarsia. There was some confusion over what yarn I wanted and the lovely people at Blue Ridge have been very generous sending me yarn. I am sending the extra to Penny Sitler (the editor) and she is going to give it away on the TKGA Facebook page.